One of my students at www.Pontifex.University has been commissioned to contribute to an exhibition, and has to create one painting a month for the coming year. She asked me if I had any experience of artist’s block when approaching deadlines, saying she was beginning to feel some anxiety about whether or not she would be able to paint at her best, and this was inhibiting her. The best I could do was suggest the following to her as my personal approach to dealing with it. I can’t promise it will work for everyone, but it has always worked for me, so it might be of help to some of you out there who a facing a similar situation too. Create your prayer corner in the traditional form (Mary on the left, Crucifixion in the center, risen Christ on the right) and pray to it (look at the icons, stand, bow for the doxology etc). Here’s a simple icon corner I created for my courtyard garden where I live. The plants are fairly new so I am waiting for them to mature - and for the vines to climb up the frames - but it’s getting there. Glory to you O God , Glory to You! Prayer to Holy Spirit: O Heavenly King, Comforter, the Spirit of Truth, present in all places and filling all things, Treasury of Goodness and Giver of life: come and abide in us. Cleanse us from every stain of sin and save our souls, O Gracious Lord. Way of Beauty prayer: God be in my thoughts and words and deeds. Send your Holy Spirit that I many complete your will, grace responding to grace. May the beauty of my work inspire those who see it to love as Christ loved, that through worship of you and charity to others, all may know His peace and joy. If you really have to deal with feelings of deep anxiety, adopt the method of analysis of fears and resentments that I outline in my book The Vision for You. I have been doing these spiritual exercises daily for nearly 30 years now, and there is no anxiety yet that it hasn’t been able to dissipate. Work like it depends on you, pray like it depends on God. 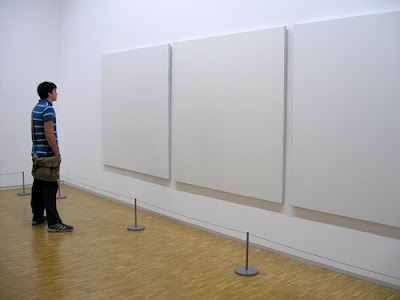 And finally, if none of that works, then try the secular method: stare at the blank canvas, or blank page, and think of a clever justification for it, as it is, as a work of art. Ideally, this will be peppered with pseudo-intellectual jargon. Then call yourself a cutting-edge Minimalist. The quality of the work is as good as the justification you create - and remember it doesn’t actually have to make sense, so you’ll get away with any old gobbledygook as long as you can keep a straight face as you do it. After, all, that’s what most other people have done for last 100 years.